The vivid beetle print of my Tory Burch Robinson Printed Middy satchel made it easy to pick this Dressbarn belted trapeze dress and Michael Antonio Kaula heels. Green, blue and white harmonize beautifully with the forest, lake and sky in this serene scenery. 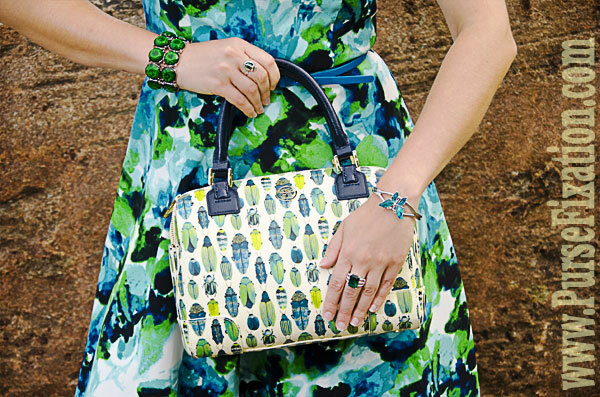 The intensity of colors on the dress matches the strong hues of the scarab beetles on the bag. I like the abstract floral pattern that makes the dress blend nicely with the wild landscape. The fit & flare cut adds this feminine, subtle touch that I love. The bright blue belt is yet another pop of color on this rich painted dress. No wonder it drew insects’ attention! My eyes were somewhere else though. I was spellbound by the engrossing garnet-bearing rocks at the Hooper Mine. Just a short hike from the Garnet Hill Lodge and you are there, surrounded by massive, sparkling rocks, each containing garnets of various shapes and sizes. What an impressive, peculiar view! A real paradise for geologists and all sorts of bugs that kept me company buzzing around on that hot summer day. As the sun was going down, the air became denser and you could feel that something hanging high in the stratosphere. The drama of the sky didn’t leave any doubts about the storm coming closer with every cloud pushed by a northern wind. It seems my beetles like that kind of weather- a promise of rain. The necklace, earrings and a ring are all malachite scarabs (Impres. Art) that must have crawled from the handbag. Handmade in a silver setting, these timeless, artistic pieces are exquisite. Malachite is an amazing gemstone with such an intensive green color. It has been wildly mined in the Urals, Russia but it can be found all over the world. In the USA, Arizona is a state where you can spot malachite. The butterfly bracelet is a souvenir from the Butterfly Conservatory at Niagara Falls. The other bracelet (NY&Company) features green stones imitating malachite, and although it is not a real gemstone, it complements perfectly the rest of the green pieces. The ring on my left hand finger (JCPenny, similar, similar, similar) displays a stunning green rectangular stone with the sparkling crystals on the sides. Green, blue and white are the hues that dominate the panoramic vista of the Thirteen Lake from the Garnet Hill Lodge. The same as the colors on my Michael Antonio Kaula heels. Extraordinary shoes with this surprising removable ribbon around the ankle. You can wear them in two ways: with or without a ribbon. What an ingenious design- both, versatile and fun! The color spectrum reflects the exact shades of the purse and the dress, so the whole outfit is picture-perfect framed by this delightful, tranquil view of the Adirondacks. Ideal getaway to find your inner strengths, soothe your nerves and calm your feelings. So relaxing! But then, it comes a moment when you have to leave and coming back from the wild forest to the crazy jungle of NYC is quite an adventure in itself. So I packed my bags, collected all my scarabs and drove back home, full of new ideas, positive energy and happy thoughts! Because at the end of each journey, the best souvenirs are the ones that make you smile and give a boost to face new challenges and take an extra step to follow your dreams. So what is your summer escape? Are you still planning your vacation or you just returned from one? Let me hear your story! Wow that place sounds amazing and LOVE the MK heels! this completelook is amazing! it makes your eyes pop wonderfully as well! Thanks for your lovely comment in my blog! I am now following you to keep in touch with your recent updates! amazing dress, look so beautiful on you! Adorable!